Who doesn’t love taco night? Our protein packed restaurant style grilled chicken tacos with a home made Pico- is very easy to make. Something the entire family can enjoy! Finely chop green bell pepper, red bell pepper, yellow bell pepper, red onion, green onion, and fresh minced garlic. In a medium bowl, mix all ingredients. Clean and slice chicken breast-place in bowl. Add olive oil, 1 tablespoon of chili powder, 1 teaspoon cumin, slice lime in ½ & squeeze one ½ onto the chicken breast. Cover bowl, and allow chicken breast to marinade 1-2 hours in the fridge. Allow chicken breast to sit out 30 minutes or until it’s room temperature before cooking. Turn on grill pan to Med-High heat, coat pan with olive oil. Remove chicken breast from marinade, pat dry and place chicken breast on the grill. Grill for 6-8 minutes each side until done. Remove from pan. And slice to your liking. 10. 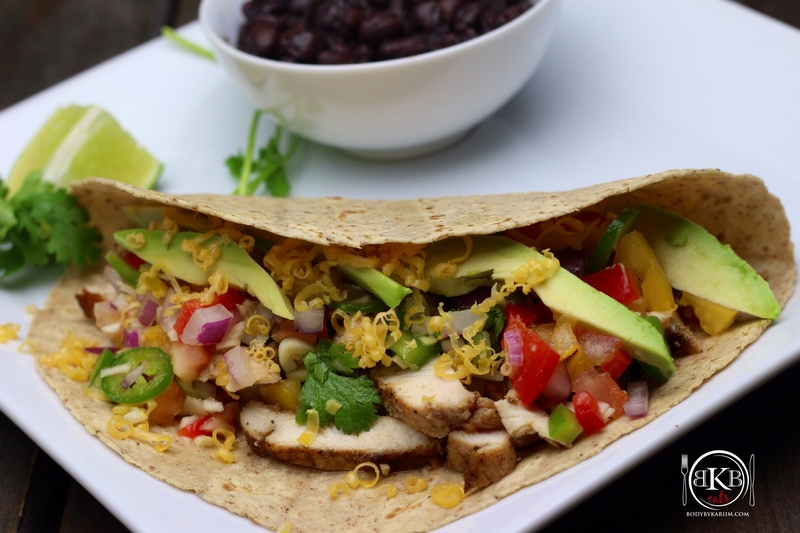 Fill tortilla with chicken breast, top with fresh pico de gallo, sliced avocado, and cheddar cheese.